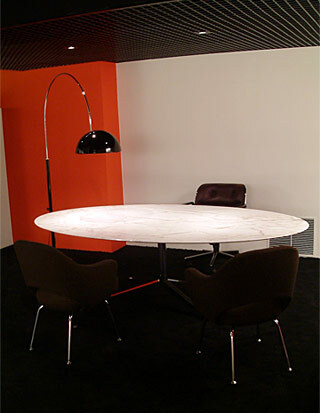 Joe Colombo and Oluce are a crucial and inseparable duo in the history of Italian design. Moved by the desire to remember Joe Colombo, who was prematurely torn from his research in 1971, Oluce, with the support of the Colombo archives, has for time been committed to the re-edition of a series of extraordinary lamps. These have been launched alongside other pieces that have continued in production like the famous Acrilica created in 1962, the Fresnel designed in 1966 and the 626 – the first halogenous lamp for domestic use – launched in 1970. Together these form a unique collection in terms of number and importance. The initiative began in 2002 with the re-launch of the 1965 Spider series, the winner of the 9th “Compasso d’Oro” design award and the re-edition of the 1968 Flash lamp and, of course, the beautiful Coupé series created in 1967. At the time, one of the most important pieces of the Coupé series was a sophisticated arched arm floor lamp. A few years on, Oluce has decided to complete this series after verifying its success among collectors and design passionates. The “arched” Coupé with its semi-spherical lamp head is indeed an “exceptional” lamp and is extremely complex to manufacture. In addition to the curved arm it has a grooved base with a special plastic handle to adjust the lamp head and the arched arm itself to different heights. The lamp head also, made of stove enamelled sheet metal, is fitted with a particular joint to adjust its inclination. The base is round but straight at the back, ideal for flush fitting against the wall. The “arched Coupé” therefore represents an element of space design that allows us to escape the “definitiveness” of a central light point. One of those design projects by Colombo that also had a significant influence on interior design. At this he was a master and other projects include enclosing an entire kitchen in a box (the Minikitchen in 1964) and rotating furniture (Combicenter in 1963 but also the Elda armchair in the same year). But most of all Colombo managed to dismantle many clichés of bourgeois lifestyle. We must not forget that today these pieces have become design icons due to their revolutionary influence already 40 year ago.